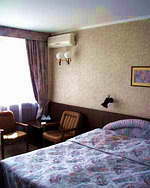 President-hotel “Kyivsky” is situated in the downtown, in a quiet green location. The Borispol Airport is a 39 km. drive away. The Railway Station is a 15 minutes drive. The city centre – Independance Square is a 15 min. walk. The Olimpiysky Stadium and Sport Palace is a 5 min. walk. President-hotel “Kyivsky” is the four star hotel complex (since 1990). The complex includs: the hotel building (340 rooms of various categories), 2 elite restaraunt-halls "Evropeysky" and "Slov'ansky"; business centre; Congress-hall for 465 seats, and comfortable conference- and meeting-rooms; a secure underground garage and open parking lot. The hall "Slovyansky", executed in old russian style, is designed for carrying out of banquets up to 100 person. Niches and a fireplace make this hall into a cosy and convenient place for carrying out of celebratory banquets and meetings. Hall "Pechrs’k" - the small hall designed on 20 person with a table of the lengthened form, made out in style of Russian modernist. Hall "Predslava" - a universal hall in classical style with an opportunity of carrying out of seminars, a meeting, banquets up to 44 person.